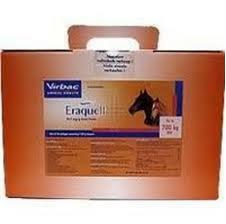 Eraquell is the sister product to Equimax, containing the active ingredient ivermectin which kills more roundworms and bots than any other worming ingredient including large redworms. Effective against small redworms, pinworms, large roundworms, threadworms and hairworms. Eraquell plays an important part in your strategic worming programme, providing unsurpassed control of worms during summer grazing. Dosage intervals are 8 to 10 weeks and each tube now treats up to 700kg.